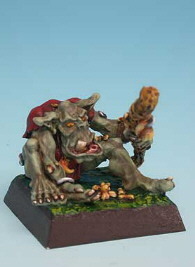 A company after my own heart this, even if the sculpting and posing is extremely variable in quality, and mostly quite poor. The range is fairly small as yet, but will hopefully continue to grow. 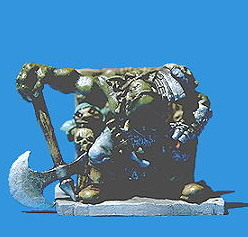 Reaper's miniatures are designed primarily for roleplaying rather than wargaming, and can be a little bit more expensive than some. The quality and style varies massively, reflecting the large number of different sculptors. In addition, since it isn't designed to provide whole armies all of one race, the Reaper shop doesn't categorise all of its products by race, so you'll have to search around a bit. 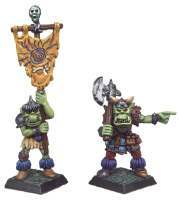 On the whole, their orcs are pretty unexceptional, with a fair few being rather poor. Better known as a historical manufacturer (their 15mm Assyrians are wonderful), Essex also happen to produce a fairly sizable orc range (both with, and without scales!). 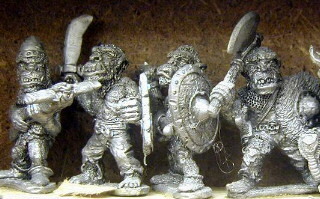 The figures are all a little bit old and dated, with the (extremely brutish and rather nicely-sculpted) heads being vastly oversized, making the armoured (to a nice degree, mail and thin plate, rather than this over-the-top modern rubbish) bodies, which stand on equally old metal bases, look rather short and squat. They aren't particularly cheap either, which means that there are probably better ways to spend your money. 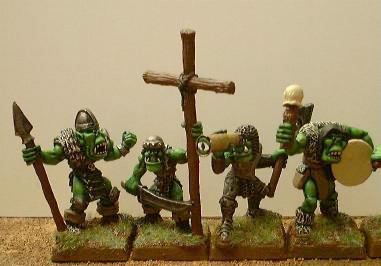 They also do a 15mm orc line, naturally. 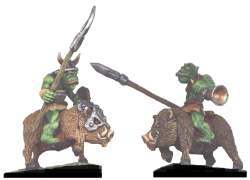 Chariot produce a goodly number of orc variants, including some rather interesting-sounding 'tiger riders'. I haven't actually seen any of these, but at a mere 85p/orc and £2.20 for a tiger-rider, they're cheap enough to buy just for curiosity's sake. 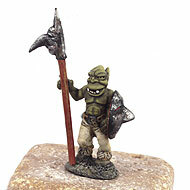 The Chariot 15mm orcs seem to be rather popular at the moment. 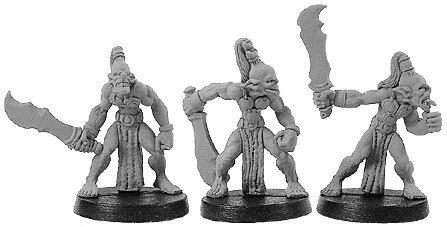 As with all I-Kore sculpts, these are rather stylised and fairly minimalist, and, as one might expect from members of the Celtos range, they are influenced more by the Celts than by the Saxons and Vikings. 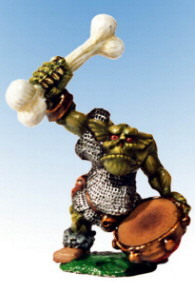 In addition, due to the proud head of hair sported by most of these, they are more half-orcs than orcs. 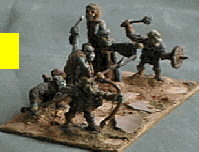 Since they are supplied with round slottabases rather than square, they will probably need rebasing for wargaming purposes, adding to a pricetag which, while much cheaper than anything at EE, is still higher than average. 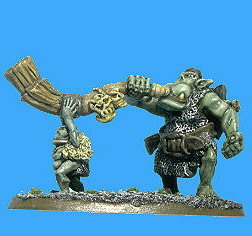 The weapons are a bit large on several variants, but the sculpting is on the whole fairly good, making them a worthy option for any fans of Barbarian Orcs and suchlike. Not really my cup of tea though. 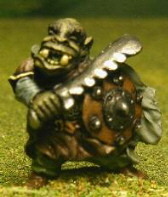 Although they don't have as much armour as I might like, and the heads are a little large, Fenryll's orcs show all the artistry that seems terrifyingly common in miniatures from across the channel, with good characterful faces (which should fit in very well with Black Tree's Fantasy Armies orcs, or with early 90's EE stuff) and plenty of detail. The one flaw is the small size of the range so far. 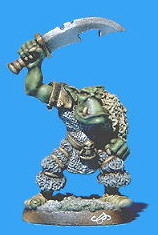 The members of Kallistra's tiny orc horde are pretty cheap, and that's about as far as their good points go. 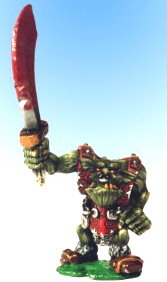 The wolfrider command are by far the best of their figures, and even they are unexceptional. They look even worse in reality than in these pictures. Another small but aggressively unexceptional range. Not as bad as some. 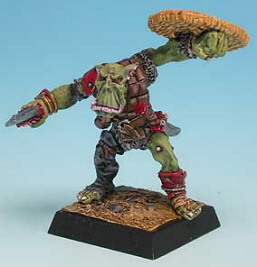 Freebooter provides a small range of only five orcs, aimed more at the collector/painter market than at gamers. All of them are wonderfully imaginative and well-executed pieces, although I have slight reservations about the Brian-Nelson-esque sculpting style. Don't even think about trying to persuade these to rank up! 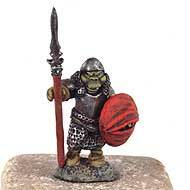 A respectably-large but rather expensive range, Excalibur's orcs are well proportioned, with good faces and poses, but the sculpting on the chainmail is very poor where it occurs, making it look more like wool than steel when painted. They might mix well with Fenryll and Black-Tree. Click here to continue this Showcase: previous page - page 1 - page 2 - page 3 - page 4 - next page.